The Order of the Argent Palm may be bestowed for enduring and continuing service in any field of endeavor. 1.) Service to Our Kingdom and to Our populace should not go unrewarded. We the Crown Trimaris, would both acclaim and affirm such service, and therefore on this _______ day of _________, A.S. ________, do name________ as a Companion of the Order of the Argent Palm Trimaris. 3.) Come forward all and know that We the Crown Trimaris do perceive that there are those who sustain Us, Our Kingdom, and Our Dream by their service. By Our hand and seal upon this _______ day of _________, A.S.________, our subject ____________ is chosen as a Companion of the Argent Palm Trimaris. 6.) Service, through grace and humility, brings the winds of inspiration and assistance to one and all. Thus the actions of ______ are like that gulf breeze which seeks to inspire each of us to action. Because of your actions and deeds, we bestow upon you the Order of the Argent Palm. Done by our hands this _______day of ______, AS _____ . 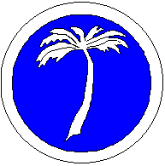 azure, a palm tree couped within bordure argent.